Growing up I spent very special times with my grandmother, her name was Gramma Santa. My Gramma knew cooking like a cookbook on a shelf, backward, forwards and upside down and I believe she concocted new recipes daily. A very talented lady in so many ways and I was so fortunate to have her in my life. Gramma Santa’s food’s ranged from easy to difficult. When she prepared Italian cookies she always made an impressive icing, or maybe it was just because I was young, enamored and could not believe how good this bowl of icing was! My Gramma would sit me on the counter and I would watch her prepare Simple Italian Icing For Every Baked Dessert because a little sprinkle of this icing just made everything taste better from chopped berries to Italian cookies. Lavishly live simple Italian icing out loud, one that will work on almost anything you can dish it with. First things first, a few tips and tricks before I provide this recipe. 1) When the recipe offers you to use the amounts of powdered sugar (confectioners), go light on the measuring and add in, this way you control how thick or thin the consistency is, as it is so much easier to make it thinner than to make it thicker. Less liquid is better and it will be thicker to spread, yet it will dry quicker. 2) Is there a difference between milk and water? I have used both with about the same results. Please note when I do this, I was using Skim Milk or Water as a sub, so if you sub in different milk you might have a different result. 3) Use this recipe on fruit, pies, cookies, ice cream, strudels and so much more. Drizzle the icing, making it thin or thicker according to the dessert you are serving. For a bundt cake you would want thicker icing that you can drizzle, but won’t run, for a strudel you would want thinner icing and for berries, a bit thicker so the berry can be coated, or you might want it thinner for dipping! 4) I consider this my Simple Italian Icing for Every Dessert because each time I make it I add one of the following flavorings which are truly used in so many Italian desserts: Anise, Lemon, & Almond. The recipe, however, can be tweaked for almost ANY flavor with simple extracts, it is that easy to use. Mix Sugar, Milk, and Extract until it forms a smooth glaze. Add in confectionery sugar just a bit at a time, until you reach the thick or thin consistency you are looking for (remember this will dry on the cookie). You can divide this mixture into a few separate bowls and make smaller batches with food coloring in order to have a few different looks. Dunk top of cookie in or paint it on with a brush or spoon to top with icing. Want the recipe for the Best Italian Lemon Drops in the photo? 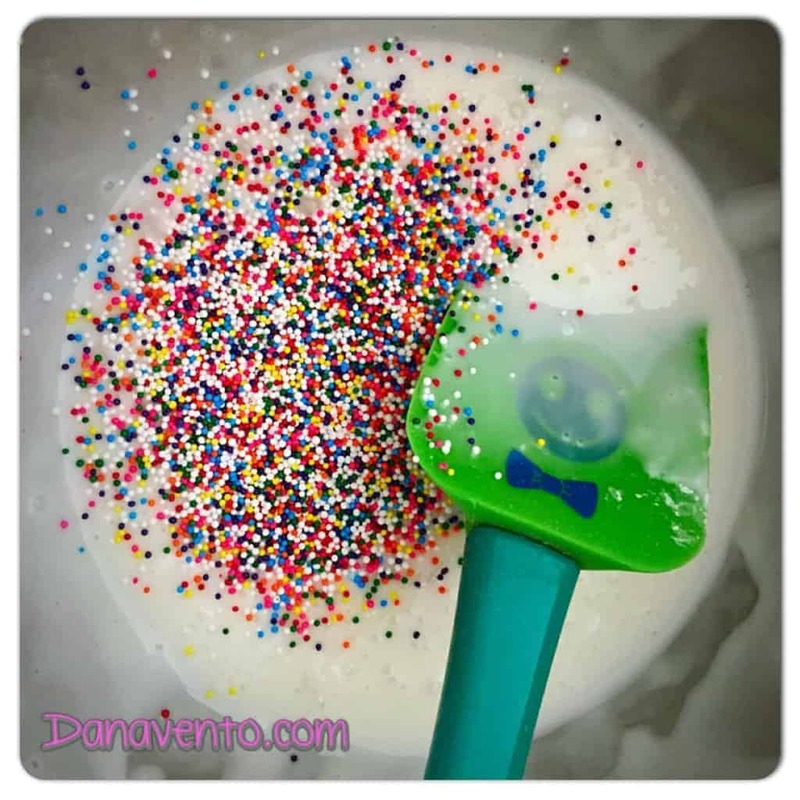 This is an easy to create icing that can be used on anything from cookies to cake and you can control the consistency by adding more or less powdered sugar! The tip on how to get those non-pareils into the icing without getting them all over the floor is priceless! You can divide this mixture in a few separate bowls and make smaller batches with food coloring in order to have a few different looks. IF you are baking Italian Cookies, basic cakes, serving fruit, you will love this icing, it is so versatile and really delicious. You don’t need to keep much in the house to create it, and most of us have confectionery sugar stored. Your step-by-step instructions with pictures are really amazing and helpful. I bet the cookies must be delicious. Look forward to your next instructing article in the future. That is simple yet so attractive Italian icing! For sure every baked dessert will look so awesome with this icing! It’s perfect!! Such a fun recipe. Thank you for sharing about your grandma. I love reading people’s memories. Wow this looks great. Awesome for the next b-day! They look pretty and easy to make. I’ll try to make those cookies following your recipe. Thanks for writing this article. It’s very helpful. Those cookies will be delicious. This looks like an amazing dessert! I love how easy it is to make. Thanks for sharing! My daughter loves to bake. I’ll send her this link. I’ve made this type of icing before and it really is so simple and it tastes delicious!! This is usually the time of year I make it and now I need to bake something this weekend so I have an excuse to make the icing. I have a feeling that I’d be eating this straight from the bowl if I made it! Your Gramma Santa seems like an extraordinary woman- so glad you were able to share such joy- and food-filled times with her. Well, yes, it looks like something I’d like to put on everything! Aren’t grandmas the best? I miss mine, she also had a lot of kitchen tricks! I am not a pro at baking and more so because I am generally not able to create a good icing for cakes. This looks super easy. I will definitely try. One of my Italian friends bakes those cookies every year what a delight! Then you really know how delish they are:) Buon Natale! I make almost this same icing whenever I need something like this. It’s so yummy! I sometimes use French Vanilla Coffee Creamer as my liquid to give it a different taste. This sounds like an easy amazing italian icing for so many baked desserts.. I remember my grandmother making this kind of icing for her italian cookies she would bake all the time. I will have to try this recipe for sure. Thanks for sharing the recipe. This is a great recipe! I use to make it with my students. thanks .. You will love it! This is such a great icing! I add it to all of my sugar cookies- makes them SO much prettier! This sounds like an amazing dessert! I love how easy it is to make as well, my mom and grandmother both have taught me amazing recipes. That looks like something that even I could learn how to make. I bet it would go great on a birthday cake that I need to make next week! Birthday Cake in layers, but don’t forget to let it dry:) I have all I can do to not eat it spoon by spoon..